Delivering Business Value through IT. Our Oakville Ontario location allows us to easily serve the North American market. Efficient drives along the major Ontario highways and close to the Toronto Pearson International Airport. 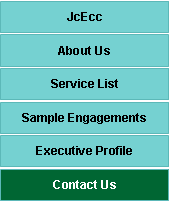 JcEvers Consulting Corp and JcEcc are trade names for J.C. Evers Corporation, an entity incorporated under the laws of Ontario in 2004. Its Consulting Principal, Joe Evers, brings over 30 years of Management Consulting experience built upon a foundation of progressive roles at two global firms, Deloitte Inc and Andersen Consulting (Accenture) and a senior role in Global IT Leadership. Recognizing the increasing need for the Canadian market to leverage executive management consulting advice without the expectation of huge corporate fees, Joe opened the firm.